On February 10th March 2011 the Police Academy in Oslo was the scene of a mini-storyline about “Conflict tackling in a multicultural society”. 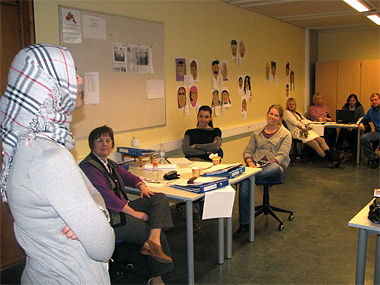 The storyline was part of an inservice course for police officers from different parts in Norway and the course holders were Marit Storhaug from the Teachers College in Oslo (HiO) and Knut Åge Teigen. The main questions were: Should hijab be allowed in the police forces? And what is a good way of performing ID-controls?